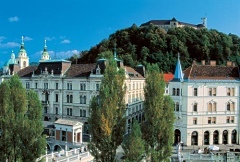 I am here in Ljubljana in Slovenia for the annual eChallenges 2005 conference. This year there are nearly 600 delegates from 46 countries, a really impressive broadening of the impact of the conference that looks at a range of issues from eBusiness, through eGovernment to Broadband and Mobile technologies. Sven van der Meer presenting a paper on the Irish Enterprise Ireland funded IMPRUVE project: instant messaging as a platform for the realisation of ubiquitous computing (as Sven will not be here I will present this paper).